Rubber Brush™ mats are constructed of tough SBR rubber to remain flexible while withstanding extreme cold. Thousands of tough, flexible rubber fingers sweep shoes clean while suction cups on the underside of the mat help to minimize shifting. 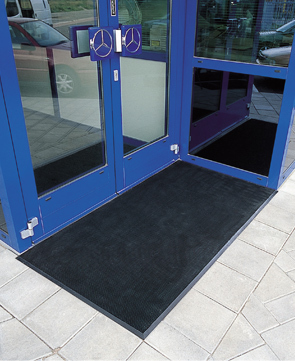 Due to its durable construction, Rubber Brush™ is the perfect year round outdoor entrance mat for schools, municipal buildings, plant entrances, and office buildings. SBR rubber remains flexible while withstanding extreme cold. Thousands of flexible rubber fingers sweep shoes clean. Suction cups on underside help to minimize mat movement.